Bermuda Islands Travel Guide, Destination Information, and Vacation Rental Accommodations. If lurid knee-length shorts spring to mind when you think of Bermuda it is entirely understandable, for the eighties fashion phenomenon put the remote collection of islands on many people’s maps all over the world. However, the chain of coral islets couldn’t be further from the in-your-face fashion faux pas, having embraced many a quintessential English tradition; from sophisticated gentlemen who are playing cricket to refined ladies quietly sipping on afternoon tea. In all, Hamilton, Bermuda consists of around 180 islands and islets, lying just off the coast of Cape Hatterras, North Carolina, in the Atlantic Ocean east of New England and its east coast. Its many coastlines are characterized by small bays with relaxing beaches of fine pale pink coral sand and surrounding vivid blue-green waters. Inland is an abundance of subtropical plants and flowers, interspersed with quaint pastel cottages on top of the endless list of attractions and the lively night life. Bermuda takes its name from the Spanish sea captain named Juan de Bermúdez, who sighted the uninhabited islands either in 1503 or 1515, the exact dates still not exact. The Spanish did not claim the islands, but they soon became an important navigational landmark for galleons and other explorers crossing the Atlantic between Spain and other early European settlement and the New World now known to us as the United States and Central America. Since Bermuda is surrounded by dangerous reefs, nautical misadventures cast the Spanish ashore on several occasions and littered the sea bed with enough booty or sunk ships and as some may call it, “treasure” for some people to consider scuba diving in Bermuda more than a recreational sport. In 1609 a man named Admiral Sir George Somers was en route from England with supplies for the recent British settlement at Jamestown, Virginia, when his ship, The Sea Venture, was wrecked off Bermuda. Finding it a rather pleasant place to be washed up, as it is today, the admiral built replacement ships of fine Bermuda cedar, sailed off and left a couple of men behind to establish a British claim to the islands. The experience of these temporary British castaways is thought to have inspired Shakespeare to write his famous piece, The Tempest. Somers returned to Bermuda later that same year but suspiciously died soon after his arrival. The British renamed Bermuda the Somers Islands in honor of the admiral, but the name failed to remain what it was known as. The Virginia Company took a very keen interest in the islands after hearing of the fact that they were quite suitable for colonization, particularly in light of Jamestown's hostile relations with the local Indians. It was only three years after Somers' misadventure, that the company organized 60 settlers to establish a permanent colony on the islands. Unfortunately, the islands were not as abundant as was first thought by the early Jamestown settlers. The shallow topsoil limited the vital agricultural piece in the economy and the lack of water prevented commercial crops like sugar cane from being introduced. The settlers soon became reliant on food imports from the American colonies, which they paid for by supplying sea salt secured from the Turks Islands and the salt water surrounding it. 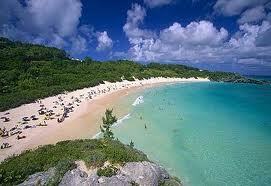 Today, the economy and beautiful geography of Bermuda is thriving, much off of the well-known tourism. In just two hours from the East Coast, you can find yourself to be in paradise. Stroll along our warm pink sand beaches. Snorkel in crystal clear turquoise waters. Play a challenging round of golf on one of our 7 championship courses. You’ll also find plenty of historical, cultural and musical activities happening all summer long. Don’t delay – while the options of things to do and see in Hamilton, Bermuda are practically endless, escape the normal stresses and frustrations of everyday life and come to this relaxing and welcoming destination. Hotels, beach side rental homes and condos are just the beginning of all the accommodation that Hamilton has to offer on top of the available rental properties in the area waiting for you to make your way there with welcoming arms.